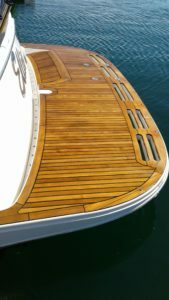 Now is a good time to plan the maintenance for your teak deck. Most decks if maintained will last a long time. 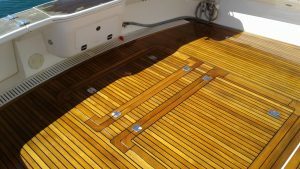 Using high pressure washers and chemical cleaners will deteriorate the fibres on the teak and subsequently shorten the lifetime of the deck. Where decks are laid with screws (unlike our process) look for signs where the screw plugs are coming lose, these should be replaced to avoid water ingress. Sometimes a light sand is required where the deck is quite ridged as this will make washing the deck easier and highlight the screw plugs that needs to be replaced. See the after photos below on another of our deck rejuvenation project.